Montessori Kids Universe of Beverly is now open at Beverly’s Cummings Center. The 11,000-square-foot space at the 600 building is the first New England location for the national franchise. Pacsial-Ong worked directly with Cummings Properties business development officer Michelle Paul on the lease, which included improvements to the indoor space and more than 2,300 square feet of outdoor play area. The center offers the Montessori-based method of education, with a low child-to-teacher ratio and a focus on children’s natural instincts of curiosity and imagination. It will also incorporate Montessori Kids Universe’s proprietary DaVinci Kids, a Reggio Emilia-inspired curriculum covering all aspects of STEAM (science, technology, engineering, art, and mathematics) programming. The largest office campus on the North Shore, Cummings Center houses a mix of corporate headquarters, retail and service businesses, medical offices, software firms, research laboratories, and micro-businesses. Among its many amenities are restaurants, fitness centers, gift shops, and salons, as well as day care for children, adults, and dogs. PHOTO: Eden Joy Pacsial-Ong, owner of Montessori Kids Universe of Beverly, held the ceremonial scissors at the recent ribbon-cutting event. 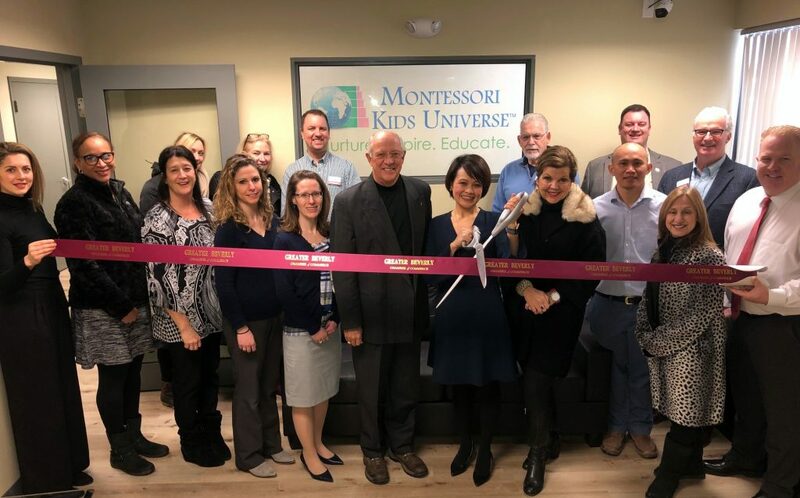 Immediately left of Pacsial-Ong are Thomas Boehm, co-founder and president of Montessori School Franchising; and Stephanie Aitchison, associate general manager of Cummings Center. Right of Pacsial-Ong are Nancy Poulos Boehm, co-founder and CEO of Montessori School Franchising.